Additionally, gender-based violence was widespread in northern Uganda. Women and girls living in conflict or post-conflict settings were particularly vulnerable to gender-based violence, a major cause of morbidity and mortality, as well as unintended pregnancy. Violence rooted in gender inequality was compounded by notions of masculinity, including the need to dominate women. Social and Behavior Change Communication (SBCC) was central to the success of this project - from providing the foundations of theory and frameworks to helping develop resources and materials that would work in the field and make a difference in the lives of women and girls all over Uganda. The Health COMpass is proud to share this project with our readership. During the first year of the project, IRH and partners conducted formative research, consisting of an ethnographic study and a program review to identify opportunities to promote the formation of gender equitable norms and attitudes among adolescents and the significant adults in their lives. The ethnographic research was conducted in order to understand how gender norms are learned, internalized and passed on and why individuals would be motivated to change and to identify individuals and social institutions which play determining roles in the formation and transformation of gender roles and explore how gender roles and attitudes influence sexual and reproductive health and gender based violence. The program review was also conducted to identify projects and programs, local and international, with successful adolescent sexual and reproductive health, gender, and gender-based violence interventions that are scalable. Shift social norms and attitudes to foster healthier, more equitable behaviors by correcting misinformation, encouraging critical reflection and dialogue, changing expectations for appropriate behavior and supporting groups to take action. Focus on life course transitions when adolescents learn new roles and social norms: children entering puberty, women and men entering marriage, and individuals becoming new parents. Diffuse new ideas and information through different levels of the community to support individual change. Engage girls and boys, sometimes apart, sometimes together, but always in relation to each other. Be scaled up by existing groups with modest additional resources. The first year of the GREAT Project was dedicated to formative research to understand the trends in the learning, internalizing, and transfer of gender norms in northern Ugandan society. During the second year, IRH and partners used these findings to develop a constellation of differentiated, yet complementary interventions. Starting in 2013, the GREAT implementing partners began distributing the toolkit to school and community groups in Lira and Amuru districts. The distribution included orienting group leaders and members on the use of the toolkit components. The scalability of GREAT rests in its strategy of diffusing information through existing groups with minimal orientation. These groups were the catalysts for spreading GREAT themes within their communities. Additionally, the project set up monitoring systems which involved community members in in collecting, analyzing, and using data to improve the interventions. Over the course of the project, all intervention components were piloted and evaluated for impact. Successful components were scaled up to additional districts in the final year of the project. Momentum started building around the toolkit, with stakeholders in and outside of Uganda interested in integrating tools such as the board game, radio drama, and adolescent flipbooks into their programs. 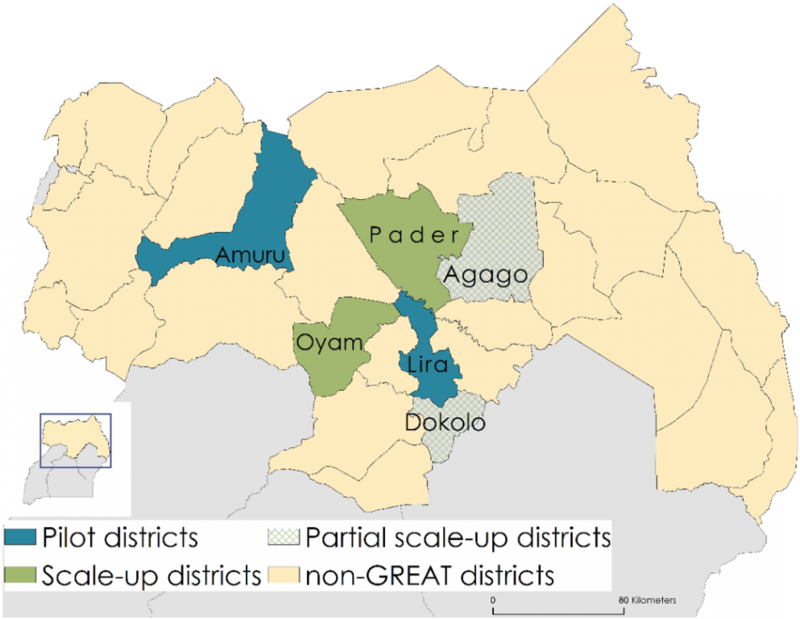 The large map below shows the pilot and scale-up areas of the project. The second phase (2011-2013) of the GREAT project focused on designing and piloting interventions. During the pilot phase, the project also rolled out a community mobilization approach known as the community action cycle and formed Community Mobilization Teams and Community Action Groups in the pilot districts of Lira and Amuru. Once the intervention package was developed, the team conducted a baseline survey in schools and households in order to measure key knowledge, attitudes, and behaviors before the start of intervention activities. The baseline survey was to serve as a source of comparison data to data collected after the end of project activities. In addition, initial interviews were conducted with a cohort of 60 young people who will be interviewed every six months over the life of the project. The results were aimed to increase understanding of how gender norms evolve over time and provide information on the ways that youth are engaging with components of the GREAT interventions. Data was collected from communities where GREAT activities took place (intervention), as well as similar areas where no activities were planned (control). The serial radio drama was an effective strategy to reach community members who did not participate in small group activities. Determining the effect of community mobilization activities remains a challenge. Although GREAT was successful in achieving individual change, expansion must focus on increasing depth and breadth of coverage to reach a “tipping point” of community change. Most young people who participated in GREAT showed improved attitudes and behaviors related to sexual and reproductive health. Exposure to GREAT resulted in more gender-equitable attitudes, and some changes in behaviors. For example, fewer older adolescents exposed to GREAT held inequitable gender norms. Changing acceptance of men’s use of violence to control their wives takes time, however improved attitudes and less violence were seen among adolescents involved with GREAT. There was a significant decrease in newly married/parenting women and men who report reacting violently to their partner when they are angry. In order to improve equitable attitudes and behaviors among adolescents, adult support is needed. GREAT contributes to an environment that supports adolescent development. The team learned that helping adolescents manage key life transitions and encouraging discussion of different expectations of what it means to be a man or a woman makes a positive difference in their lives. District officials and community organizations are now working to include GREAT in their budgets, work plans and monitoring activities in order to maintain the momentum. GREAT will act on pilot findings to scale up in a way that moves beyond individual to community-wide change, and contributes to broader learning. I learned that education is not only for boys, but also for girls.